This important reference, edited by Ronald Ross Watson and Betsy Dokken, collects the research needed to make the distinct connection between pre-diabetes, diabetes, and cardiovascular disease. Glucose Intake and Utilization in Pre-Diabetes and Diabetes: Implications for Cardiovascular Disease explains the mechanisms of progression from pre-diabetes to diabetes to cardiovascular disease. Since pre-diabetes and diabetes are important cardiovascular disease risk factors, and impaired glucose metabolism among cardiac patients is extremely prevalent, the importance of reviewing pre-diabetes and its involvement in CVD complications is vital as one applies food and glycemic control to slow progress to diabetes and heart disease. 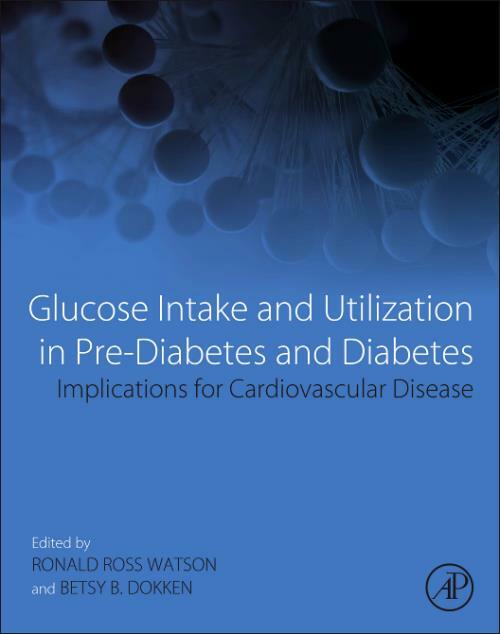 The book further focuses on glucose intake and utilization in diabetes, including coverage of diabetes in the development and pathology of cardiovascular disease, risks and epidemiology of cardiovascular problems promoted by diabetes, macrovascular effects and their safety in therapy of diabetics, beta cell biology and therapy of diabetes, and nutrition to modulate diabetes. Chapter 13: Hypertension and Dyslipidemia in patients with prediabetes: dietary and other therapies? Ronald Ross Watson, PhD, is Professor of Health Promotion Sciences at the University of Arizona, Mel and Enid Zuckerman College of Public Health. Dr. Watson began his research in public health at the Harvard School of Public Health as a Fellow in 1971 doing field work on vaccines in Saudi Arabia. He has done clinical studies in Colombia, Iran, Egypt, Saudi Arabia and the United States which provides a broad international view of public health. He has served in the military reserve hospital for 17 years with extensive training in medical responses to disasters as the chief biochemistry officer of a general hospital, retiring as a Lt. Colonel. He is a distinguished member of several national and international nutrition, immunology, and cancer societies. Dr. Watson's career has involved studying many lifestyle aspects for their uses in health promotion. He has edited over 100 biomedical reference books and 450 papers and chapters. His teaching and research focuses on alcohol, tobacco, and drugs of abuse in heart function and disease in mouse models. Dr. Betsy Dokken has training and degrees in nursing. Her Ph.D. is in experimental diabetes in rats working on insulin resistance. Her postdoctoral fellowship was at the applied Cardiovascular Physiology Laboratories in the University of Arizona Sarver Heart Center. She studied ischemia-reperfusion injury in diabetic hearts. Betsy is a certified diabetic educator and registered nurse. Dr. Dokken is an adjunct clinical assistant professor of nursing. Her principal appointment is in the section of Endocrinology, Diabetes and Hypertension with 20% of her time spent on clinical practice (diabetes, obesity, and related disorders). She has published 7 review chapters, 13 peer reviewed chapters and 10 journal articles relating to CVD and diabetes. Her grants and research focus on diabetic heart disease. Betsy has been extensively involved in nursing and diabetes societies in Arizona and nationally.